When you are truly innocent, you fail to realize how guilty you appear. Or, at least that is what I continue to tell myself after a funny incident in the Jakarta airport. I was traveling to Jakarta for a work event, arriving on Friday, flying back to Bangkok on Sunday. A colleague from Malaysia that also attending the event and asked me to bring a few large sized bags of a Thai seasoning powder, pork flavored. Being a quick trip, I carried a small overnight bag on-board with two bags of the seasoning powder packed in the bag, unsure of which brand of the seasoning my colleague wanted, I bought two different brands. Someone visiting Indonesia for a short-time with a few largish bags of powder in a carry-on bag, what could possibly be suspicious about that? When viewed by a customs officer watching a baggage scanner, a lot. Jakarta customs inspects all bags, upon arrival each bag is scanned. I drop my bags- one workbag with seemingly every Apple product ever made and one overnight bag with a few toiletries, a few changes of clothes and two bags of powder- onto the scanner belt and walk to the other side of the scanner to wait for the bags. I could see the 4 customs officials viewing the scanned images showing the content of my bags, I could see the raised eyebrows as my second bag, with the seasoning powder, passed through the scanner and the image popped up on their screen. Oh, this will be interesting, just season power, pork flavored, what, doesn’t everyone have close to a kilo of pork powder in their carry-on bags? The second bag was scanned again. Sure enough, the seasoning powder was still there, looking more suspicious than ever. The second scan resulted in more than raised eyebrows, now it was time for a quick conversation amongst the customs officials and a trip to a small room. And so there I sat, in a small conference room, two bags of pork seasoning powder on a table with four customs officials on the other side of the table trying to figure out what the heck was going on. The customs officers were nice, certainly they were shocked at seeing images of bags of powder and possibly even more surprised that it was pork seasoning powder. We discussed the uses for the pork powder which proved a bit of a challenge for me as I don’t use the seasoning powder on anything I cook; I was scrambling to explain the uses while trying not to appear even more suspicious. After a few minutes discussion with me and amongst themselves, they opened a bag of the seasoning for inspection. The next question: who would sample the pork powder? Rubber gloves were donned, a thorough sniff test was performed and a quick sample was tasted and a good laugh was had. The customs officials taped the bag of pork powder closed, gave it back to me and wished me a good stay in Indonesia. I hope my colleague enjoys the pork powder, I’ll remember transporting it for a long, long time and will always smile when I see the bags of the pork powder in grocery stores. 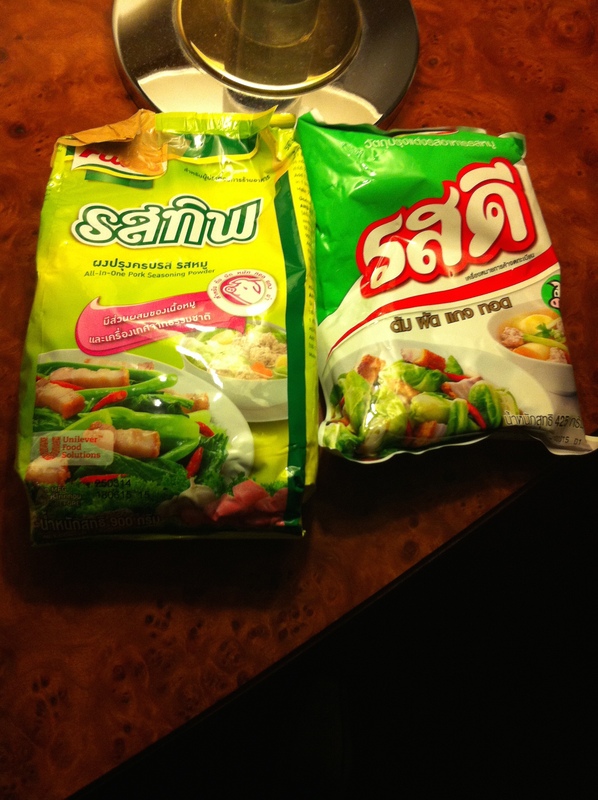 This entry was posted in Quick Trips From Bangkok and tagged customs officials, Indonesia, pork seasoning powder, travel. Bookmark the permalink.